Amsterdam and Rotterdam did not reach the highest take-up levels for logistics property in the Netherlands in 2018. The area surrounding Venlo and the West-Brabant region did. 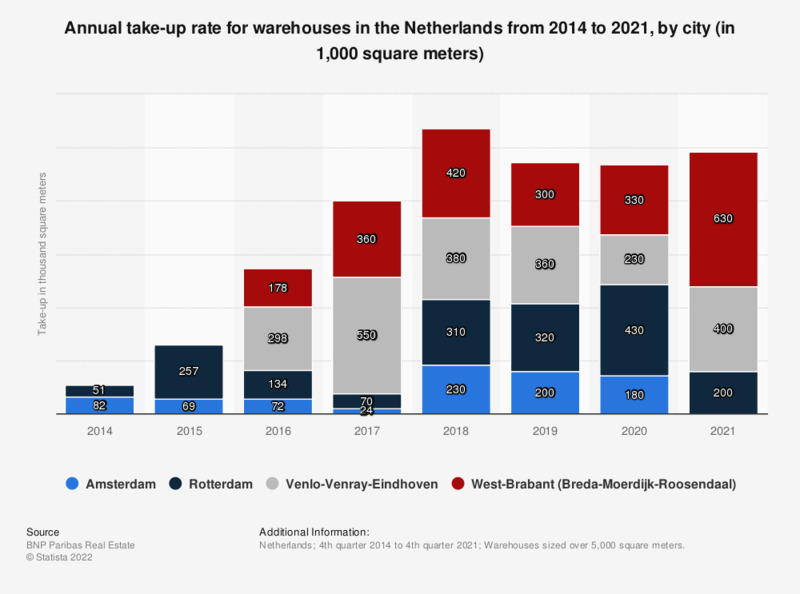 Unlike for example the United Kingdom (UK) or Germany, warehouses or distribution centers (DCs) in the Netherlands are less centered around major cities. This is probably due to the small size of the country and the comparatively high connectivity to the cities and ports of both Rotterdam as well as Antwerp in Belgium. The southern provinces of the Netherlands are also popular hotspots for logistics real estate because of the lower rent prices. The total size of the Dutch logistics market was approximately 28 million square meters in 2016, the highest number in nine years. This is because many international brands opened distribution centers in the Netherlands. Venlo, for example, supplies European fashion brands Michael Kors, Tommy Hilfiger, Calvin Klein and Under Armour via Trade Port Venlo Noord. Spain’s Inditex (the company behind Zara, Pull&Bear and Berschka) are to open a logistics center in Lelystad in 2019, whilst Lidl opened its European e-commerce DC in the West-Brabant region (around the city of Roosendaal) in 2018. The Netherlands’ growth as a logistics hub for retailers and e-commerce companies in Europe hasn’t gone unnoticed. In 2018, 73 percent of all investments in logistics property in the country came from foreign investors. Most cross-border capital came from Germany and the UK, with nine percent coming from South Korean investors.